I picked up some flowers just the other day - bi-colored carnations (never underestimate the power of carnations! 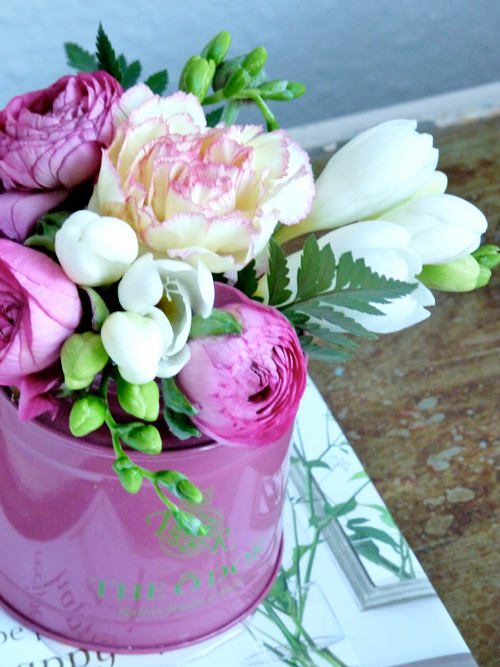 ), creamy white freesia, and gorgeous pink ranunculus. Instead of putting them all in one vase, I decided to split them into four arrangements so that I could spread them around different rooms to brighten up more than one area of the home and to stretch my money - so for a mere $11 I have more than enough flower power to go around. I put some in a white IKEA vase, a few stems in a vintage blue glass vase, more in a vintage creamer from my husband's grandmother, and finally a few in a tea tin that I couldn't part with after I drank all of the tea because I loved the color so much. These flowers are now in my bedroom and living room and the house smells beautiful! In the living room, different view. My workspace, a tiny corner of my living room. The glass vase is vintage for only $1 at the flea market last Saturday -- I love it! 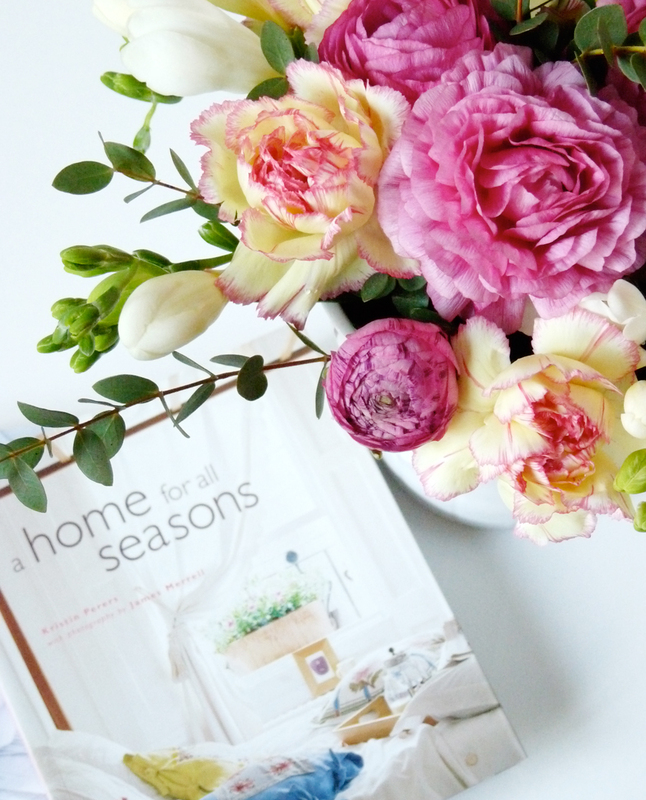 Leslie Shewring will be here with us in a moment with Color Me Pretty for more floral inspiration which is a nice boost on a Wednesday, don't you think? I love Spring! 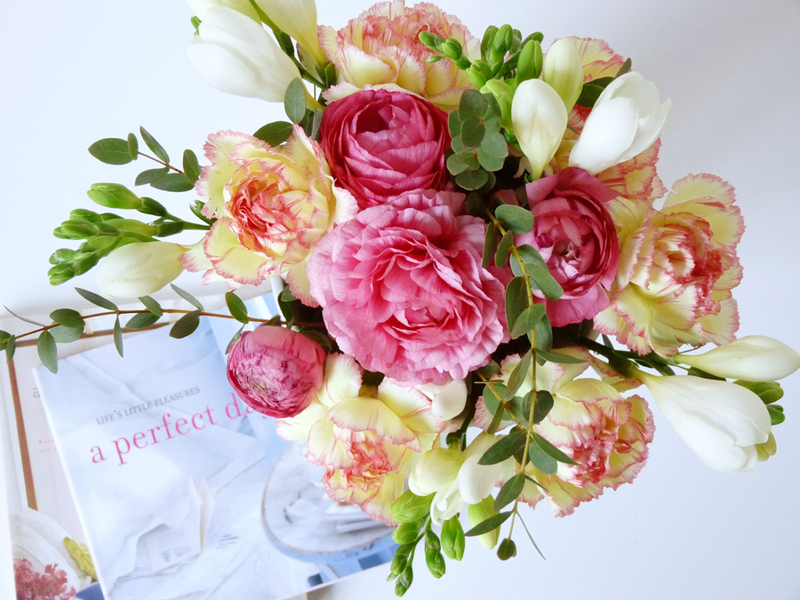 Maybe our flower posts today will inspire you to pick up some inexpensive blooms and go home and have a little fun arranging them and placing them bedside, near your perfume tray, on the coffee table on some books... What do you think?